Even those of you who read nothing but X-Men-related stuff should've crossed paths with this guy by now. Starting in Fantastic Four (I think), He revealed that the mission of his race is to observe the progress of life in the cosmos without interferring. Uatu is the watcher of our sector and has broken that code to save Earth, since our planet's brimming over with insane amounts of conflict. Drawn while my computer was at messed up in early 2005, Uatu is still uncolored and barely retouched. There are flaws, but I still like how he turned out. The pose is based on one that I've seen him in a zillion times, including one drawn by Jack 'the King' Kirby. But, of course, the design is mostly based on how John Byrne drew him. 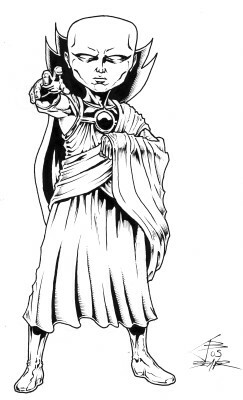 Uatu is just one of those characters that won't look right if you try to screw with the design too much. When drawing that kind of character, I try to adapt myself to their design more than trying to warp them into what I'm comfortable in drawing. In this pic, it's all about the eyes. Haunted by the horrors of bass-ackwards characterization humanity, yet still determined to observe for those glimmers of hope. I'm sure that thought was inpsired by watching too much cable news. This one was drawn in 2005, but colored in 2006. I also intended for this to be part of a MUGEN intro but I cancelled that. You can find a pixel-friendly version of that as the 2nd alternate version.